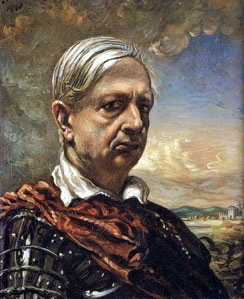 In the early Seventies Giorgio di Chirico used to come most days at noon to the Caffe Greco in the Via Condotti in Rome . He was a very old man (born 1888) and he dressed in a dark suit. He looked like a senator and the waiters greeted him as “maestro”. It was a long time since he had painted in the style that made him famous and had been a sort of prelude to Surrealism. 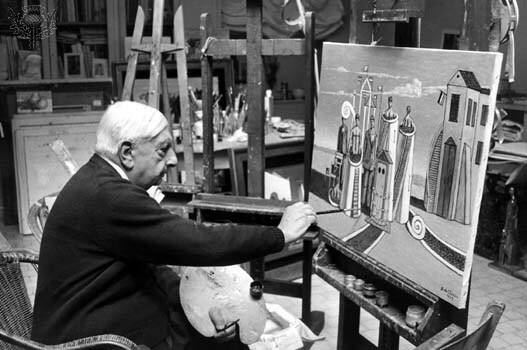 Indeed he had exhibited with the Surrealists in Paris in 1925, but I always thought his work more disturbing and mysterious than theirs. Some described his paintings of deserted squares in apparently abandoned cities “metaphysical”, and he was quite happy with the term. They remain paintings which stick in the memory and play in the imagination, and this is as much, I suppose, as any artist can hope for from his work, whether that is painting, music or literature. The Greco was my favourite café in Rome, and not only because the granita di caffe` con panna and chicken sandwiches were especially good. I liked the gilt and plush and the portraits of famous men – were there any women? I think not – who had frequented it. Some were paintings, some drawings and some photographs, among them one of Colonel William Cody (Buffalo Bill) who had brought his Wild West Show to Rome in the early years of the century. There was one frame high up on the wall from which the portrait had been removed; I was told that it had been Mussolini, and told others this, but I never knew if it was true. You could spend hours happily there. Sometimes I gave English lessons in the caffe`. Sometimes I wrote short stories there, as if I was playing at being Hemingway in a Paris café in the Twenties. One day my American friend Al came in with a photographer. Al was the Rome editor of the American Express magazine “Travel and Leisure”, and they were there to photograph di Chirico for a feature article. Seeing me, Al said I must join them, and so I was introduced to di Chirico. He wasn’t much interested . 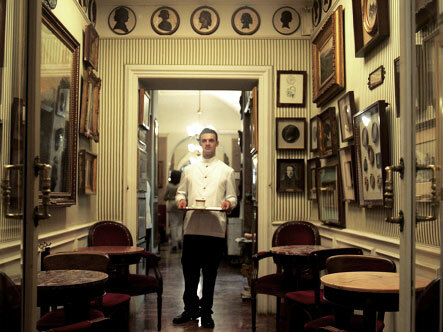 I suppose too many people had been introduced to him there over the many years he had frequented the caffe`, and had addressed him , with suitable reverence, as “Maestro”, as I, imitating the waiters, did also. But Al insisted that I should be photographed with him. “Promising Scottish writer meets Maestro”, he said with agreeable irony. The Maestro made no objection; this sort of thing too must have happened too often for him to care one way or the other. Still, I wish now I had a copy of the photograph. It was a long time since he had painted in the style called metaphysical. Way back in the Thirties he had turned against it and reverted to Classicism , studying the Old Masters and painting in their manner. Artists I knew then used to say he had done this in order to get his work into the Vatican Collections and the joke was he hadn’t succeeded. But this was probably no more than Roman malice. I guess the reversion to classicism went with dressing like a senator. Years later, after he was dead, there was a show of his later paintings in London, and it happened to coincide with a week when I was appearing on the Radio 3 programme, “Critics’ Forum”. I can’t remember who the art critic on the panel was – Edward Lucie-Smith perhaps – but he was very dismissive of the show, calling it “kitsch”, and others took their tune from him. I saw what they meant and yet I rather liked the work, one self-portrait of the Maestro dressed in armour and looking withdrawn and melancholy, especially. My fellow critics clearly thought me perverse, or simply foolish; and perhaps I was. Perhaps it was merely the memory of the dignified old man in the Greco that caused me to come to his defence. I don’t know why he made the change in style from work that impressed so many to work that pleased so few. Perhaps the autobiography he wrote near the end of the war explains his reasons, but I haven’t read it. In any case there is something to admire in a successful artist turning his back on the style that had made him famous and working determinedly for years in a style that was hopelessly out of date and won him so little appreciation. Then the other day, when I had scarcely thought of him in years, I was at a party in London where for the first time for ages I met Rebecca Fraser who had edited the paperback edition of a novel, The Death of Men, which is set in Rome and which has one scene set in the Greco. She had given it a marvellous di Chirico cover, from his metaphysical period of course. “The best cover of any of my books, “ I said. “Pity the binding was so poor, the books tended to fall apart”. “Yes,” she said sadly, “cheap glue“ Still the cover caught the mood of the novel perfectly. We agreed on that. It was, like so many of his paintings of that period, disturbing and enigmatic. Enigmatic? Yes. That was the impression I retained also of the old man looking as if he had made the short journey from the Senate in the Palazzo Monteciterio to the Greco. Allan Massie is the award winning author of twenty one novels and several non fiction works. He is also a prolific columnist and literary critic, writing for, among others, The Scotsman, The Spectator, The Daily Telegraph, Times Literary Supplement, The Literary Review and Standpoint Magazine. His latest novel, Death in Bordeaux, will be published by Quartet Books in June. Bumped off the top spot! But by a maestro at least. Or two of them. Happy memories of Caffe Greco as well. 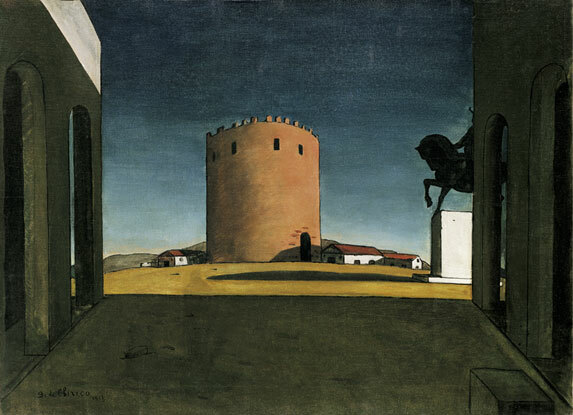 Really like the Red Tower painting, shall have to do a bit of research on di Chirico, only a name until last night, so thanks for that. Perhaps our Editor should instigate a ‘Memory Lane’ tab… or perhaps not. ‘Travel’ will do very well. More please! Collectors of Allan Massie’s first editions (now scarce) may like to know that the original 1981 hardback also featured a homage to Di Chirico by Gerard Lecoeur. His first novel, ‘Change and Decay in All Around I See’ (1978) featured one of the earliest cartoons by the now celebrated Posy Simmonds.